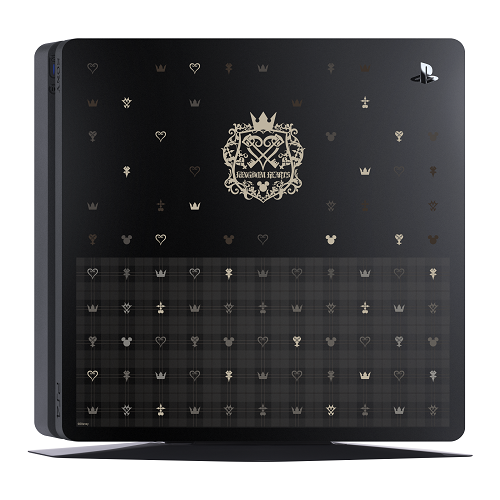 Sony and Square Enix have announced a new limited edition PlayStation 4 Slim bundle pack, which features a special top cover designed with various symbols from the Kingdom Hearts series alongside a beautiful emblem. This new PS4 and cover are scheduled for release in Japan on January 25th, 2019, just in time for the release of Kingdom Hearts III. The PS4 bundle pack can be purchased with a HDD capacity of either 500 GB or 1 TB. With the former priced at 33,980 yen and the latter at 38,980 yen. Both with an added tax. Additionally, you can purchase the top cover by itself for 3,500 yen. Preorders are now available on the Sony Store Japan and will close on October 31st. The bundles both feature a Jet Black PS4 body, with a Kingdom Hearts III top cover and an original Kingdom Hearts III theme. A controller and standard accessories will also be available with it. These bundles will not come with the game itself and have to be purchased separately. It should be noted that this is separate from the KHIII themed PS4 that had been announced back in June. Posted in Tokyo Game Show 2018.
pass. The Pro version of the KH3 theme looks better anyway. this one looks pretty clean come to me baby! Simple and Clean, one might say? I’ll get my coat.